You may not remember when TV was black and white. You may not remember when there were no remotes and you had to get up to change channels or adjust the volume. Even if you do, you still probably don’t remember the DuMont Network. Like a lot of people involved with the early development of television, Allen B. DuMont started in radio. In 1924 he was in charge of tube production at Westinghouse, the country’s largest radio manufacturer. But by 1928, after his innovations had increased daily tube production tenfold, DuMont got bored and wanted to try something new. Companies like RCA and the radio networks (CBS and NBC) were already experimenting with television. DuMont proposed to his bosses at Westinghouse that they do the same. 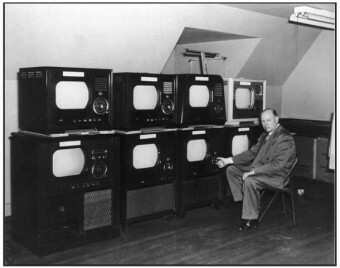 They weren’t interested, so DuMont quit and set up his own TV lab in the basement of his house. Just two years later, he had perfected the cathode ray tube, the component that allows a TV set to convert the received broadcast signal into an image. In other words, the most vital part of a television. And unlike previous cathode ray prototypes, DuMont’s lasted indefinitely, rather than burning out after a few days. 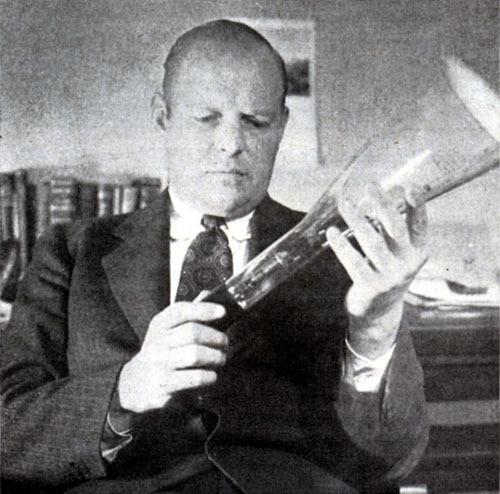 DuMont sold the patent to RCA and used the money to start a TV manufacturing business. In need of more cash, he sold 40% of the company to Paramount Pictures in 1939, giving him plenty of money to make TVs. One problem: In 1939 few people were buying TV sets—there weren’t any TV shows to watch. CBS and NBC aired a few experimental broadcasts in the New York area in the early 1940s and were rapidly moving toward regular commercial broadcasts, but when World War II broke out, they halted all TV work. DuMont felt that to sell TVs, there’d have to be programming. And now it looked like he’d have to do it himself. In 1944 DuMont got a broadcasting license and opened his first station in New York: WABD (for “Allen B. DuMont”). He opened a second station, WTTG (after DuMont’s vice president Thomas T. Goldsmith) in Washington, D.C., in 1945. Then, using more than 200 miles of coaxial cable, DuMont connected his lab in Passaic, New Jersey, to the two stations. On August 9, 1945, DuMont aired an announcement that the U.S. had just dropped an atomic bomb on Nagasaki, Japan. That brief message was seen on TV sets in New York, New Jersey, and Washington. The DuMont Network—and commercial TV—was born. The network began regular broadcasts a year later with its first show, Serving Through Science. The television industry was about to take off. NBC was on the air in several cities in late 1946, including New York City, Philadelphia, and Schenectady, New York. CBS and ABC, a new network, followed in 1948. That year, more than a million TV sets were sold in the United States, most of them made by DuMont Labs. The third DuMont station went on the air in 1949—WDTV (for “DuMont Television”) in Pittsburgh. It was a smart move: CBS and NBC weren’t broadcasting in Pittsburgh yet, even though Pittsburgh was America’s sixth largest city at the time. 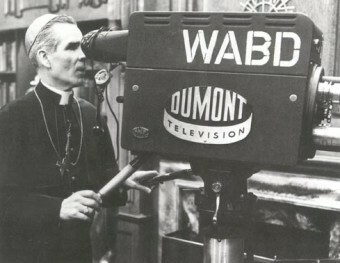 In cities where it competed with NBC and CBS, DuMont was a distant third in the ratings; advertising profits suffered. But the profits from the monopoly in Pittsburgh offset the losses and kept the network afloat. CBS and NBC moved a lot of talent from radio to TV (Jack Benny, Edward R. Murrow, Lucille Ball). But DuMont didn’t have a built-in pool of entertainers from which to draw. So for onscreen talent, the network hired New York theater actors and comedians. (Jackie Gleason hosted a variety show called Cavalcade of Stars; The Honeymooners originated as a sketch on that show.) And unlike CBS and NBC’s shows, which were produced in state-of-the-art TV studios, DuMont shows were produced in unused rooms at Wanamaker’s, a department store on Broadway. The First TV Sitcom: Mary Kay and Johnny (1947). Mary Kay and Johnny Stearns, married in real life, played “themselves.” Most of the action took place in the couple’s apartment. The First TV Soap Opera: Faraway Hill (1946). Widow moves to small town and falls in love with a man who’s already engaged. The First Religious TV Show: Life Is Worth Living (1952). Hosted by Catholic bishop Fulton J. Sheen, who delivered lectures on moral issues. It was DuMont’s top show. 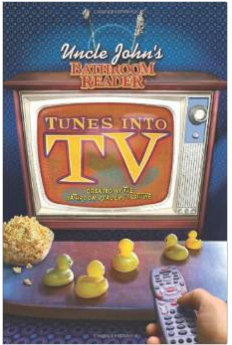 Home Shopping: On Your Television Shopper, a host presented items (cheap jewelry, small appliances) and viewers called in to have them shipped to their home (they paid for them COD). Televised Sports: DuMont was the first network to regularly air football and basketball games (and boxing and wrestling matches). The First Science Fiction Show: Captain Video and His Video Rangers (1949). A group of interstellar police keep Earth and its space colonies safe. TV Advertising: The other networks did with TV what they had done on radio: One company sponsored an entire show. But DuMont sold individual blocks of commercial time—thirty seconds to a minute each—to multiple sponsors. That’s how TV advertising works today. DuMont’s low-budget try-anything style produced a lot of really weird TV, too. The Plainclothesman: A private-eye filmed from the point of view of the main character, who’s never seen. Night Editor: A newspaper editor acts out news stories. Inside Detective: A cop solves crimes without ever leaving his office. DuMont finished in third or fourth place in the ratings every week (always behind CBS and NBC, and always jockeying with ABC for third). He had affiliates in just three cities—New York, Washington, and Pittsburgh—but independent TV stations around the country paid DuMont and ABC for the rights to broadcast their shows. Allen DuMont wanted to buy more stations in more cities to increase viewers. But he couldn’t—an FCC rule allowed a company to own a maximum of five stations. DuMont already owned three; his partner, Paramount, owned two. Then in 1953, United Paramount Theaters, a movie theater chain (not owned by Paramount Pictures), bought ABC and funneled millions of dollars into the network to make it more competitive. It worked: By the end of 1954, ABC had pulled ahead of DuMont into a solid third place. Most of the independent stations that had been splitting their schedules between ABC and DuMont shows switched to ABC programming exclusively. As a last-ditch effort to save the company, DuMont sold his most profitable asset, WDTV in Pittsburgh, for $10 million (about $90 million today). But the money wasn’t enough—the network was still losing viewers and stations to ABC. In early 1955, he decided to pull the plug. Life Is Worth Living broadcast on DuMont for the last time on April 26 (the show moved to ABC). The network feed remained intact for occasional sports broadcasts until August 6, 1956. That night, after a boxing match, the DuMont Network went off the air for good. DuMont sold the New York and Washington stations to media mogul John Kluge for $7 million, who used them as the basis of a consortium of TV stations called Metromedia. Allen DuMont became a philanthropist and donated much of his fortune to help fund National Educational Television, a nonprofit TV network that evolved into PBS. He died in 1965. The DuMont Network still exists today…sort of. Australian businessman Rupert Murdoch, owner of the 20th Century Fox film studio, set out to start a fourth major network in 1986. To do it, he put together a loose affiliation of independent stations around the country—many of which were the same stations that ran DuMont programming in the 1950s. But his first step: He created the basic elements for a new network by acquiring Metromedia, including the two original DuMont Network stations in New York and Washington, D.C., and created the Fox Network. Thank you for this interesting and well-written article. If you have a Roku. All of the old Dumont network shows are streaming. Just search the channels for Dumont.